Indonesia is close to picking Korea's Daewoo Shipbuilding and Marine Engineering as a priority negotiating partner for a submarine project worth US$1.08 billion. A senior government official said Taufik Kiemas, the speaker of the Indonesian People's Consultative Assembly, told Prime Minister Kim Hwang-sik on Wednesday morning that Daewoo is virtually certain to get the nod for the project. "There still are some more processes to follow, but the deal will be struck, unless something comes up," the official said. 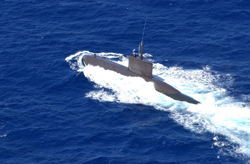 Once the deal is secured, DSME will sell three 1,200-t 209-class submarines to the Southeast Asian country. It would be Korea's biggest arms export, more than double the value of the $400 million export of T-50 supersonic trainer jets to Indonesia and similar to last year's total arms exports of $1.19 billion. Daewoo was up against powerhouses like Germany, France and Russia to win the contract. "The submarine export to Indonesia will pave the way for Korea to securing a market in Southeast Asia, because other Southeast Asian nations such as Malaysia and Thailand are also planning to purchase submarines," the official claimed. Kiemas is the husband of former Indonesian president Megawati Sukarnoputri. He visited a shipyard at Daewoo headquarters in Okpo on Geoje Island on Tuesday.